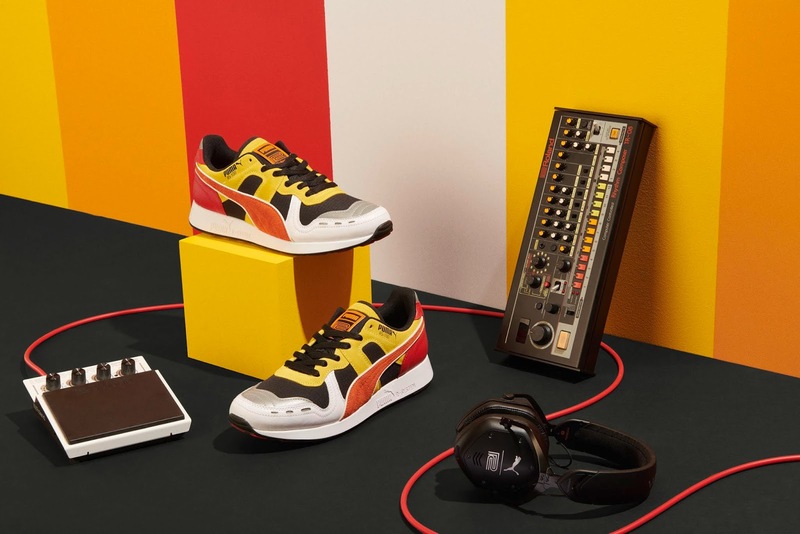 PUMA and renowned Japanese manufacturer of electronic musical instruments, Roland, drops a second silhouette that completes the RS sneaker pack – the RS-100 Roland. 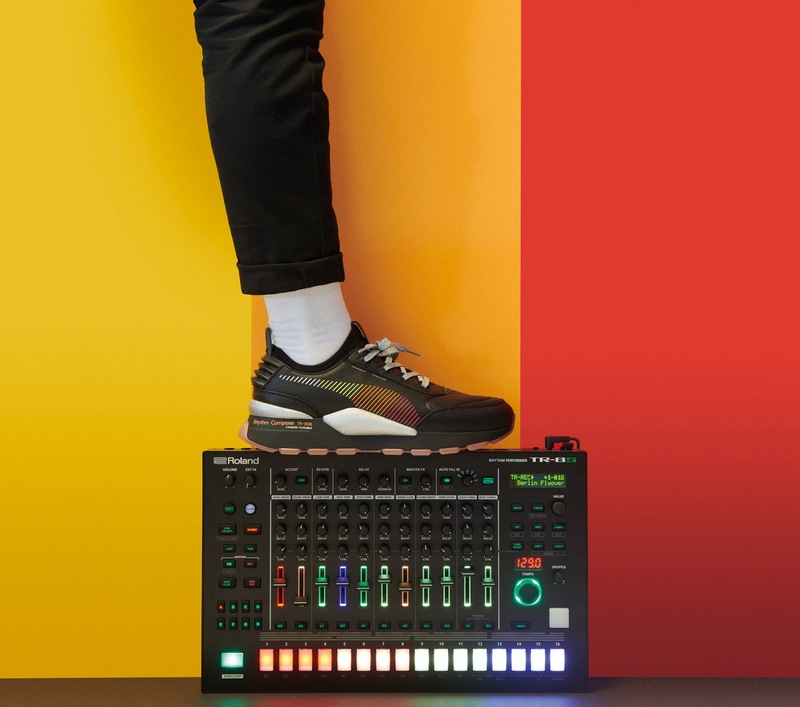 The RS-100 Roland follows the story of reinvention – inspired by the past, shaped by the colourful histories of both brands and reimagined for the future. While the RS-0 Roland is a complete reboot of the R-System, the RS-100 Roland retains a more retro look but is decked in modern materials. The RS-100 Roland’s upper features a vibrant orange suede Formstrip with white reflective edges amidst a combination of white-red pebble leather, black ripstop nylon panels and yellow suede. PUMA and Roland branding can be found on the tongue label, footbed and the anodised metal hangtag. “Rhythm Composer TR-808, Computer Composer” is printed on the heel. A PUMA and Roland logo is printed on the footbed, while the outsole features lines to mimic the lights on a sound synthesiser. All colours and detailing represent 80’s retro hues found on a Roland TR-808 drum machine. 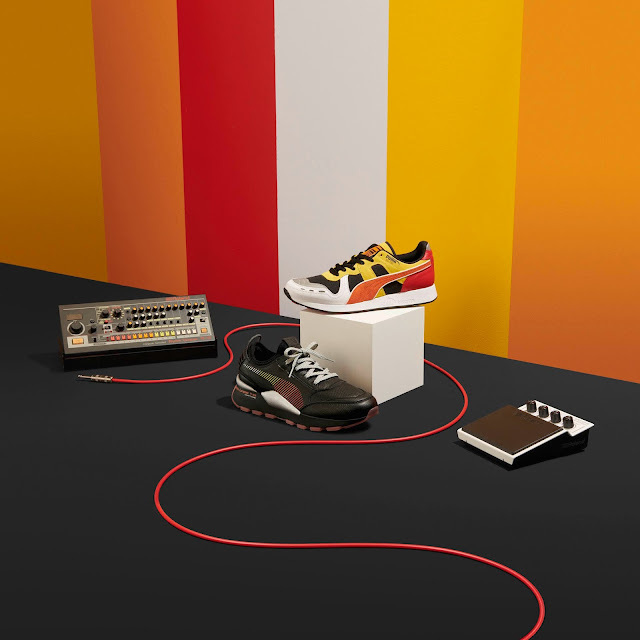 Unveiled last season, the RS-0 Roland, also inspired by the game-changing TR-808 drum machine, features premium leather black upper, micro perf vents, 6mm flat, reflective laces, reflective midsole details and signature TR-808 colours – red, orange and yellow, on the Formstrip. Familiar notes like “Rhythm Composer” and “Bass Drum” accent the midsole while the orange hue continues to the translucent rubber outsole. PUMA and Roland branding can be found on the tongue label, footbed and the anodised metal hangtag. This exciting collaboration extends Roland’s commitment of innovation and continuing to shape the sound of modern music, setting the standards in music technology for the world to follow. For PUMA, it continues to enrich their stories of reinvention by partnering with influential and creative brands, individuals, and institutions that strive to push culture forward through innovation in design, style, technology, and more. Both the RS-0 and RS-100 Roland sneakers drop globally on August 8th, internationally known as #808DAY. The iconic TR-808 drum machine is celebrated for its legendary status and credited by many as the spark that lit the flame of hip-hop music worldwide. Cop the RS-100 Roland for R2 599 and the RS-0 Roland for R2 999 at PUMA SELECT and Shelflife stores.